Guilds of Ravnica brings new ways to experience one of Magic’s most iconic planes. We have a host of new products lined up for players of all skill levels. We tested this product in select stores with Dominaria—35-card booster packs in which all cards share a color (or are colorless), including one rare or mythic. Results were good, so we’re widening their availability. But they’re a little different this time. For Guilds of Ravnica, each booster is based on a two-color guild: Boros, Selesnya, Izzet, Dimir and Golgari. Packs still come with 35 cards, including one rare or mythic. They’re mostly for beginners—an early purchase after they’ve started with a Welcome Deck or Planeswalker Deck. The idea is to let them expand their collection with colors that they’re already invested in. Guilds featured: Boros (white/red); Selesnya (white/green); Izzet (blue/red); Dimir (blue/black); Golgari (black/green). Guild Kits have everything a player needs to represent their guild, from defending nature with the Selesnya Conclave to spreading the vengeance of the underworld with the Golgari Swarm. They're ready-to-play 60-card decks. Like Theme Boosters, they're based on the five guilds in Guilds of Ravnica. But Guild Kits feature cards from all Ravnica blocks, plus guild swag like pins, stickers, and a spindown life counter. In the meantime, these hit shelves on November 2 to coincide with Ravnica Weekend. Make sure you’re stocked up! Each deck features two colors: a white/red deck to take on black/green. Players can pick one and instantly challenge another friend to learn together. It also has accessories. You’ll find spindown life counters, turn order cards, and a rules reference booklet to equip new players with everything they need to learn. 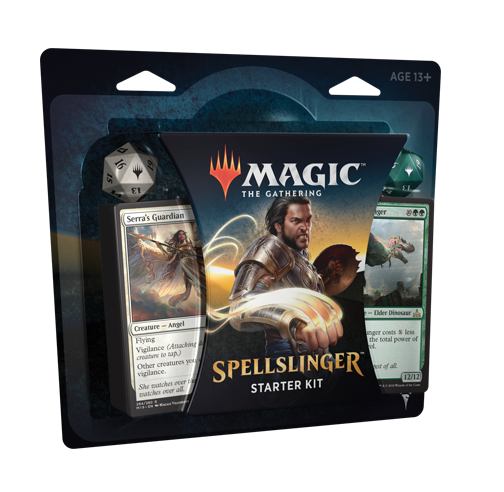 You can see the Spellslinger Starter Kit fully unboxed in this video. Don’t miss out on the full Guilds of Ravnica experience—get in touch with your distributor about these products today.